Above: I present a cheque for £10,000 to Michelle Gray from St. Nicholas' Hospice (left) and Karen Roberts from CLIC Sargent (right) at Culford School Sports Centre on Thursday January 24, 2008. Photo by Victoria Spofforth and copyright The Bury Free Press 2008. Copies available from http://www.photostoday.co.uk/ ref. 8vs2401008. 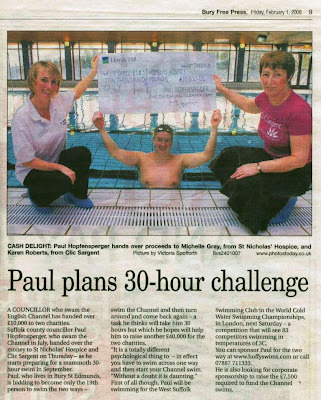 Above: Article from the Bury Free Press, Friday February 01, 2008. (Click picture to download the article). 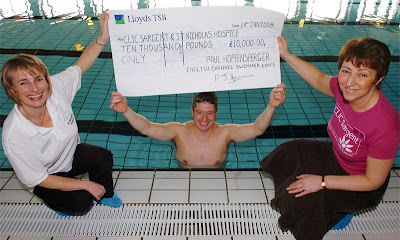 This week was a bit of a milestone on the fundraising efforts, as we passed the first £10,000 in sponsorship for the two charities I swum the channel for, and am attempting to swim it two-ways for. The original purpose of swimming the channel, was to try to raise a total of £50,000 for them. Hopefully, this donation is the first of what I hope will be a total of 5 £10,000 donations. For further information on CLIC Sargent, the UK's largets Children's Cancer charity - CLICK HERE. For further information on St. Nicholas' Hospice in Bury St Edmunds - CLICK HERE. If you wish to sponsor me, simply click on either or both of the "JUSTGIVING" icons, further down this page, and donate securely online. Alternatively, please e-mail me at paul@hoffyswims.com and I can let you know how else you can sponsor me. Hi Julieann. Thanks very much, and no probs. re the blog. Speak soon. Kind regards. Hoffy.